Presented at Motel inside the EPCOR Centre and directed by Jenna Rodgers, Chromatic Theatre – Calgary’s newest theatre company – makes its debut with Michael Golamco’s Cowboy Versus Samurai. Golamco sets out to dismantle racialized stereotypes, and he does so very explicitly with Chester – an amalgamation of pop culture Asian stereotypes. Chester’s extreme, over-the-top expression of “Asianness” is a confrontation of how our culture operates with regards to race. Just as Chester embodies sweeping generalizations about Asians, so too does he paint his own broad strokes about white people. These assumptions effectively erase the individual out of the picture. Chester eventually comes to realize that his preoccupation with being Asian has obscured his own individual identity. What is interesting, though, is that Breakneck, Wyoming remains a homogeneous, bigoted “sea of white” throughout. It is, of course, the small rural town and its small-minded residents that are Golamco’s obvious culprits for prejudice. And Del – the play’s spokesperson for white people – is part of the problem. Yes, by the end of the play, Del makes significant progress in terms of how he thinks and talks about race, but the fact remains that Golamco’s attempt to subvert stereotypes falls short of rising above the very thing he sets out to criticize. Despite this, Golamco’s does manage to bring forward some insightful observations surrounding identity and inter-racial dating – the latter being a topic rarely discussed as earnestly and with such vigor as it is here. But the script lacks character depth. Awkward dialogue does nothing to help characters who struggle to say anything interesting when race is not involved. And it does little to help us truly care about Travis and Veronica’s relationship. There are some sharply written moments to be found, but character development, for the most part, takes a backseat to the play’s major ideas. Hsi fully commits to the ridiculous nature of his character during both scenes and scene transitions. Tan is a great straight man to Hsi’s antics, while also being entertaining in his own right. The duo are a good pair. Jennifer Lee Arsenault’s set design is aesthetically pleasing with its waterbrush look. The use of spinning cardboard boxes, hung on tubes in rows of three, is an ingenious way of changing scenery. (Though they are prone to getting stuck in mid-spin). A questionable production choice is the company’s use of a live cap gun. The gun’s loud bang is deafening inside the small studio space – which only seats 50. A sound cue would suffice. While the company could have chosen a tighter script, Chromatic Theatre’s production of Golamco’s Cowboy Versus Samurai fares well enough as a first impression. It will be interesting to see how the company develops from this point on. 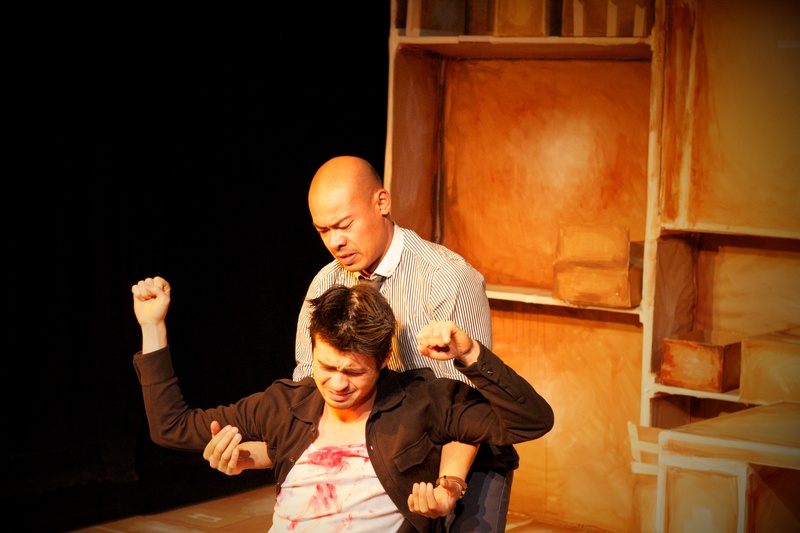 Chromatic Theatre’s production of Michael Golamco’s Cowboy Versus Samurai runs at Motel (EPCOR Centre) from Nov 13 – 22, 2014.